The Department of State Services (DSS) wishes to inform the general public that it has uncovered a sinister plot by the Rivers State Governor Nyesom WIKE to disrupt machinery of governance in strategic Federal Government agencies by provoking a violent breach of peace in the Federal Capital Territory (FCT), Abuja, today, 22nd December, 2016 and beyond especially at this yuletide season. To achieve this, the Governor had secured the services of one IKENGA Imo UGOCHINYERE, a Personal Aide to the Senate President, Bukola SARAKI (Sen), to mobilize some hoodlums to execute their plan. 2. The aim of the plot is to cause mayhem, a complete breakdown of law and order and cast the security agencies and the Federal Government in bad light. It is also intended to divert public and international attention from the ongoing Police investigation into the unwholesome role played by the Governor and some of his cronies in the violence that trailed the re-run election in Rivers State which resulted in the gruesome murder of civilians including the beheading of DSP Mohammed ALKALI and some of his colleagues as well as the brutalization of INEC staff who failed to do the bidding of the Governor. 3. In furtherance of this plot, protesters are to besiege the National Human Rights Commission, Independent National Electoral Commission (INEC), National Assembly, the Nigerian Army and Police Headquarters as well as British High Commission, US Embassy and the UN Secretariat, Abuja; all in an effort to raise false alarm that Rivers State was under siege of security agencies during the elections. While the obvious aim is to draw public sympathy and international attention to spurious allegations of involvement of Federal agencies in violence during the last elections in Rivers State, the actual objective is really to trigger a round of violent action against the government and create opportunity for idlers to join the deceitful protest. Part of the orchestration is to provoke the security agencies and prompt them to take action against the protesters that could result in bloodletting. It is in this line that IKENGA had gone to the outskirts of Abuja to mobilize unemployed youths to carry out his bidding. All this was to be done for a fee and resources to be provided from the treasury of the Rivers State Government. 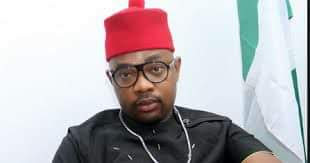 It is also worrisome that IKENGA would engage in this nefarious plot when, after his last arrest earlier this year by the Service, he had pledged to be law abiding and not to cause a breach of the peace. 4. Though IKENGA is now at large, the trio of Emeka IDIBIA, Ugo APUAMAGHA and Ejike NWACHUKWU have been arrested and are helping with further investigations. These men were picked up at the mobilization venue trying to perfect the logistics for this unholy enterprise. The young men were hired by IKENGA to take custody of items and materials for the planned violent protest. The recovered items include banners, placards and posters with denigrating, inciting and hate inscriptions meant to impinge the authority of the Federal Government and further subvert the entire machinery of governance in the country. 5. In order to make this look credible, IKENGA and his cohorts had adopted such groups as Lawyers in Defence of Democracy (LDD) and Citizens for Good Governance (CGG) as cover to supposedly make them look like serious minded civil rights groups and thus bring them into collision course with security agencies. Investigations have so far revealed that while IKENGA is the field organizer and coordinator of the planned protest, Governor WIKE is his sole financial sponsor. The DSS is disturbed that the Governor who is the Chief Security Officer of the State will stoop so low to hire thugs and hoodlums to attack the Federal Capital Territory (FCT) and create an atmosphere of chaos and disorder at this yuletide season. 6. Accordingly, the Service wishes to clearly state that it, and in fact other security agencies, will not be cowed, or by any means allow any person or group of persons no matter how highly placed to subvert Nigeria’s statutory institutions meant to protect critical installations and law abiding citizens. In this regard, the Service also states in unequivocal terms that no amount of intimidation, grandstanding or outright manipulation of facts will be allowed to stop it and other agencies from conducting their duties as constitutionally mandated or concluding investigations into the Rivers State electoral violence. 7. Finally, the Service wishes to restate its commitment to the protection of life and property in the FCT in particular and Nigeria in general. Consequently, it advises youths to resist the temptation of being lured by desperate politicians to undermine the government or engage in acts capable of causing a breakdown of law and order. It calls on all Abuja residents to go about their normal businesses as the Service is committed to ensuring that the full wrath of the law is brought against persons or group of persons who may threaten the peace and stability of the country.